It’s been quite some time since I told my story first, about 5 ½ years. A lot has happened during that time and I would like to talk about the main things. In the fall of 2006, I went to Reykjavik University, where I started studying mathematics. During the time I spent in the university, I gained some valuable experience which I will remember for the rest of my life. I lived for 3 semesters in student housing with many exchange students from various countries. That was without a doubt one of the best times in my life. There I met many of my best friends and it was very interesting to live in such a multicultural community. I went few times abroad when I was at the university. In the summer of 2007 I went to Spain to study Spanish for one month with some other students from the university. During the spring semester of 2008 I went on a study trip to Brussels for few days through a course I was taking at that time, called Iceland and the European Union. In Brussels we visited some of the main buildings of the European Union. In the fall of 2008 I went as an exchange student to Torino, Italy, for five months. It was a very interesting experience living abroad for so long time, especially because of the different cultures. Also, since most of the people in Italy don’t speak much English and I didn’t speak much Italian at first that was one of the problems in the beginning. But I didn’t let that stop me, I tried to learn some Italian, at least enough so I could take care of myself. Last year is one which I won’t forget, especially because of my studies and my disease. 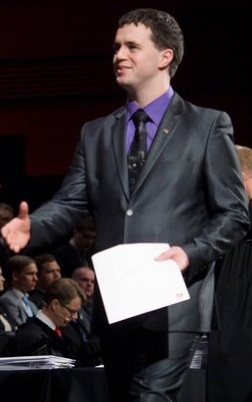 In the spring I finally graduated from Reykjavik University with my B.Sc. degree in mathematics. It was great to finally complete this degree. I had been thinking for a while what I should do next, if I should continue with mathematics and go for the master’s degree or if I should switch to a new field. In the fall of 2011 I started a new degree in the University of Iceland, BA in Anthropology. Although there is quite a difference between mathematics and anthropology, the first semester has been very interesting. I haven’t decided where I will work in the future, but maybe I can combine these two areas somehow. 2011 was also an important year related to my disease. Since I was first diagnosed with IVA, I had been taking 5 capsules of Glycine 3 times a day. I’ve also been taking 2 tablets of Carnitor each day, along with some calcium and vitamin. The doctor that has been treating me all these years (he’s a paediatrician, so you can imagine that it can be strange sometimes when I go to see him), said that it would be ok if I would start decreasing the amount of Glycine I take. The main reason for that was because my body had stopped growing, but I would still have to keep on taking the Carnitor. So I started taking 9 capsules a day for a week, then 8 per day for a week, and so on. Finally it came to that day that I took my last capsule of Glycine. It was so strange to stop taking the Glycine, since I had been taking it every day since I was diagnosed at the age of 2. It’s also sort of a relief, because now I just take my medicines twice a day and I don’t have to worry about taking the medicines with me to school. My doctor also told me that I would be ok if I started trying out other food that have higher amounts of protein. So sometimes I eat a hot dog, a hamburger or something else, but I also can feel when I had enough. I can’t eat much chicken and when I had enough meat (or some other high protein food) I can feel it. Maybe it’s my body’s way of saying stop. I hope that my story has been interesting to someone, and I would of course be glad to help people in any way I can. My name is Bjarki. I was born on the 21.st of November, 1985. I live in a town called Selfoss, which is in Iceland. When I was about 2 years old I was diagnosed with a metabolic disorder, Isovaleric Acidaemia. My father, Gudmundur (1956), works as a carpenter. My mother, Elin Arndis (1956), works at the post office. I have two brothers, Larus (1981) and Josef Geir (1978). They both work as carpenters. In the summer of 1987 I was taken very ill to a hospital. After many tests, the doctors discovered that I had Isovaleric Acidaemia. Since it was discovered, I have always taken certain pills to help me break down the proteins. I take 5 pills Glycine and 1 vitamin in the morning, 5 pills Glycine and 1 tablet Carnitor at lunch and 5 pills Glycine and 1 tablet Carnitor at dinner. In addition I take 2 tablets of Calcium Santoz, which I dissolve in water. I have many friends that know about my disease. The most common question, when I tell people about my disease, is “what do you eat at Christmas?” Many people would find it difficult, not being allowed to eat meat or fish. I have to say, that I'm getting used to it after all these years. I always find something to eat. There are some times when I can really feel that I have a disease. e.g. one time we went out to eat. We went to a steakhouse. When I looked at the menu I realized that there was nothing that I could eat. On 21. November 1985, a beautiful and healthy boy was born, named Bjarki. The first six months, he prospered well and was in good health, but at that time he nourished only on breast milk. At the age of 6 months he started having food with the breast milk, which he had until he was 13 months old. At that time, at the age of 6 months, he started getting sick and the illness increased until the second half of summer 1987. He was hospitalized at a hospital in Reykjavík very sick and almost unconscious. After several tests it appeared that he had Isovaleric Acidaemia. These times were very difficult for us the parents, his two brothers and the whole family. It became very difficult while we were adjusting to changed diet. Also the thought that the disease could have caused brain damage, but we knew that we would always love him despite what would happen. It later appeared that Bjarki Thor didn't have permanent brain damage, and since that he has performed well in school.